IntraLinks is the global leader in virtual data rooms with a 30% worldwide market share. For the uninitiated a virtual data room is an online space in which due diligence documents can be securely placed during an M&A process to facilitate due diligence and other deal related activities. As a result IntraLinks has a unique perspective on the merger and acquisition marketplace. They see deals that are moving toward closing as much as six months before any public announcement of the transaction is made. IntraLinks has aggregated this proprietary business intelligence to create a global deal flow indicator based on real time deal room activity. The Q4 2013 IntraLinks Deal Flow Indicator shows a 17% increase in year-on-year early-stage global M&A activity, with particularly strong performances in North America and Europe, Middle East and Africa (EMEA). Per IntraLinks “This points to a recovery in global M&A activity in 2014, continuing to build on the healthy levels of early-stage M&A activity seen in 2013.” Supporting that conclusion IntraLinks recently conducted a survey of approximately 1900 global M&A professionals in which 73% of the respondents reported expectations of an improved M&A market in the first half of 2014. Click on the photo of IntraLinks Vice President of Strategy and Product Marketing Matt Porzio for a full explanation of the Deal Flow Indicator and more on their perspective on the M&A market. This is consistent with our experience at FOCUS, where we saw some slowness in the first few months of 2013 but a pickup in new deal activity as the year moved forward. We completed one closing in December 2013 and three in January 2014, with three more deals in the pipeline with expected February 2014 closing dates. We’ve seen extraordinary valuations for many of our clients, consistent with the overall market trends referenced above. We believe this is a unique time for entrepreneurs, particularly for Baby Boomers who have spent thirty years or more building value in their businesses. these owners have a window in which they can sell their businesses at valuations that may not be witnessed again in their lifetimes. There’s now way to be sure how long the window will remain open. The one thing we know for sure is that, once the window closes, it will be very hard to complete a sale transaction and valuations are likely to be significantly lower. 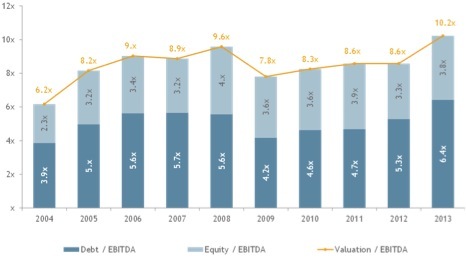 Permalink | Comments Off on 2013 Deal Valuations Reach All Time Highs; What’s in Store for 2014?